"Build your own system, base starts as keyboard tray only". This pre-configured Keyboard tray system is designed to create an ideal ergonomic setting for users by enabling them to switch between the right and left hand while typing on the keyboard. It is key to position the keyboard tray in a way that the user stays in the neutral reach zone for all typing and mousing activities. At the same time to avoid excessive pressure to either right or left hand, it is highly recommended to train the brain to mouse with both hands. The Dual Clip mouse with this keyboard tray is targeted for the users who like to avoid the long term pressure put on either wrist through excessive mousing. By combining one of these platform options with one our award winning mechanisms, you will create the most non-instrusive, intuitively adjustable keyboard support available. Humanscale 900 keyboard platform is made of phenolic, an ultra strong, remarkably thin (¼ inch) composite that is non-toxic, durable and easy to clean. Standard 900 keyboard platform is designed to support nearly all standard keyboards and to fit most desks. Humanscale 900 keyboard dimensions: 19" W x 10-5/8" D.
90HD dual High Clip mouse platform comes in 8.5" diameter. Clip mouse is the only mousing platform that let users adjust their mousing position in all three dimensions for maximum comfort. 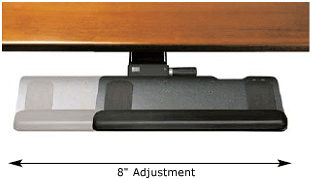 With height, depth, lateral, and tilt adjustability, it can be positioned where it is needed for truly custom support. A decade of ergonomic research shows that using a negative sloped adjustable keyboard tray maximizes the time spent working in a neutral hand, wrist and upper body postures. These postural benefits can’t be achieved by just using a keyboard on a height-adjustable work surface." - Dr. Alan Hedge, Cornell University.